With a 9 to zip vote, the San Diego City Council approved the Ocean Beach Community Plan Update, yesterday, the 29th of July and in the middle of the afternoon. Immediately, the 150 plus OBceans jumped to their feet with whoops of delight and sustained applause that went on for minutes. It was an emotional day for OB, with the Council vote culminating a very long process of updating the community’s urban design blueprint, a blueprint that will significantly affect OB for the next 20 to 30 years. After a staff report recommending approval, and after those who opposed the Plan or aspects of it testified and after those who testified in support of it, District 2 Councilman Ed Harris made the motion to approve it. Councilwoman-elect for District 2 Lorie Zapf seconded it. Without much debate, in light of the overwhelming presentation of the Plan’s advocates and as they looked out over the Council Chambers to see a ‘sea of blue’, the Council then voted unanimously to approve it. The Council vote was an explicit rejection of the recommendations of the San Diego Planning Commission. Todd Gloria, Council President, said he was “proud to support Harris’ motion” and he hoped that OB would appreciate and support the plan updates for other communities – like his own.” This statement was met with hearty applause. 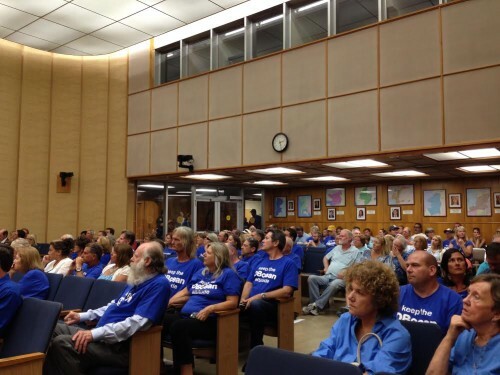 The day began for Ocean Beach with an assembly of blue-shirted people downstairs and outside City Hall. 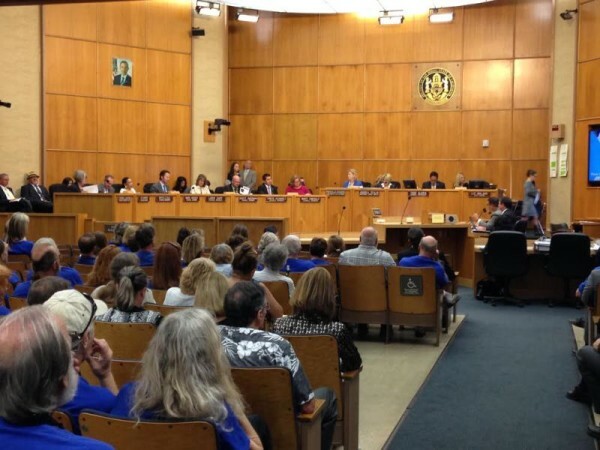 Organizers had asked OBceans to wear blue for the Council meeting, and blue T-shirts with the words “keep the OBcean attitude” were everywhere. Friends were hugging each other and strangers were being welcomed. Channel 10 showed up and began interviewing some of the organizers. A few minutes before 2pm people starting filing into the line in front of the metal detector. Once settled in, President Gloria asked for the staff report. Planning Director William Fulton began his brief presentation, explaining that only a handful of issues remained unresolved with the California Coastal Commission, and he felt they could be addressed once the Community Plan was approved. Fulton then turned it over to Teresa Millette – the chief city planner for OB – who gave an overview of the Plan to the Council. Gloria then invited public comment – and the “opposition” speakers rose to speak one-by-one. Property-owner Debbie Applebee was first, calling out this writer as editor for describing what was occurring on the 5100 block of West Point Loma as “gentrification”. She then gave her definition – a much nicer description that Gormlie’s harsh one. Applebee complained that only 16% of OB residents own homes. She then recounted how she had encountered a “hawker” at the OB Farmers Market who was giving out false information about the Plan and the Petition. She called the OB Planning Board an “advisory group to a special interest group”. “Homeowners are underrepresented,” she claimed, saying she only wants to build her home on West Pt Loma. Applebee called for the Council to strike section 4.7.9 from the OB Community Plan. Section 4.7.9 has been the focal point of controversy ever since the San Diego Planning Commission voted to change it during their hearing on the Plan in late May. The Commission wanted to delete language referring to OB’s floor-area-ration of 0.7, and wanted to insert more watered down text. For nearly 40 years, the OB Planning Board has operated with that floor-area-ratio, ever since its inception in 1976. But as Councilman Harris declared, the Planning Commission “got it wrong”. Next up was David Stebbins who called his 3-story home on West Pt Loma “ground zero for this debate”, stating that he supported the Plan and was “only opposed to 4.7.9”. Stebbins asserted without proof that “there’s a lot of bad information out there.” He said he had submitted 107 letters from property owners opposed to the Plan. After Stebbins came property-owner Al Cox, who immediately faulted the OB Rag for calling him “a greedy developer” for building his 3-story next to Stebbins’ house, and renting it out as a vacation rental at hundreds of dollars a night. A couple more speakers said they opposed the Plan, including Barb Nelson who complained that people who signed the petition were signing it based on the cover sheet, which she said had “nothing” about the controversy over 4.7.9. (Editor: the Petition explicitly cited both the language of the Plan for that section as well as the language the Planning Commission wanted to insert.) Mark Rose also opposed it but for the wrong reason, stating he was “opposed to variances” – which is exactly what Stebbins and Cox wish to keep alive. Gloria then opened the floor for those who favored the OB Plan. One by one, advocaters got up – each with a different area to cover. This writer was first, and I described the history of the making the OB Planning Board back in the mid-1970s and all the various plans produced over the years by the City. Turning to the 1975 Precise Plan eventually approved by the then San Diego City Council, I described how on page 18, the Plan called for a floor-area-ratio for most of Ocean Beach of 0.7. I said that the Plan including the election of a planning committee was approved by then-Mayor Pete Wilson, “a die-hard Republican as you know”, and a full City Council, reading the names of the then-Council members, which included Floyd Morrow and Maureen O’Connor. Following was Mindy Pellesier, one of the key-organizers of the campaign in support of the OB Plan. Her steady words citing the lengthy update process and how the Planning Commission had made bad decisions concerning OB over the last few years, and how OB was supposed to be unique and different brought tears to some eyes in the room. Gio Ingolia – co-chair of the Update process committee as well as one of the key organizers – and Pete Ruscitti – current OB Planning Board chair – both gave stunning responses to Stebbins’ accusations about what was going on, what the history and issues were actually, using maps they had prepared to make their points. Ruscitti got it exactly right. 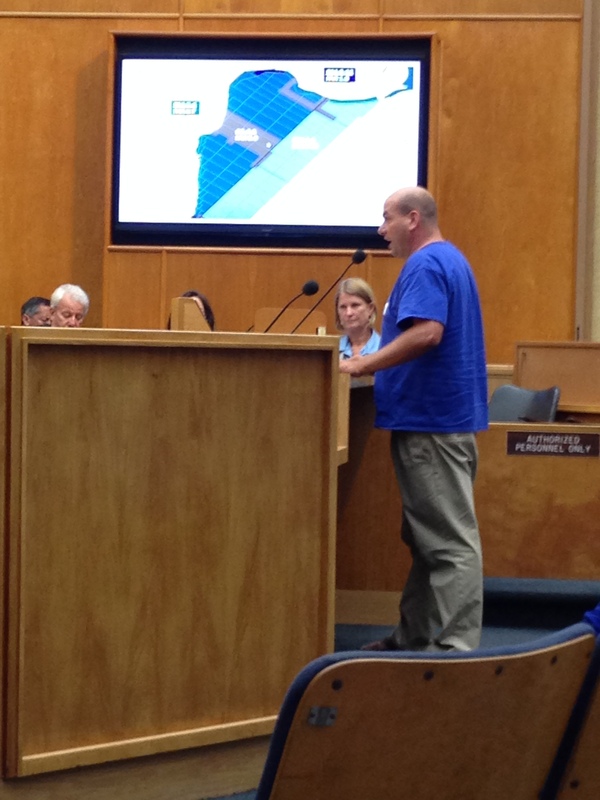 The grounds, he said, that the Planning Commission used to approve variances for the few properties on West Pt Loma apply to hundreds of properties throughout OB, therefore the variances are not for “unique” and “exceptional” circumstances – which they by law are supposed to be. Gretchen Newsom – the head of the OB Town Council – followed Ambert and in one of the more emotionally-charged speeches, cited all the community groups that have come out in support of the OB Plan. As she announced the group’s name and its leadership, people in the audience affiliated with the group would rise and stay standing. A pre-meeting conference with some of the organizers: L to R: Pete Ruscitt, Gio Ingolia, John Ambert, Mindy Pellissier, and Frank Gormlie. The OB Planning Board; the OB Woman’s Club, Friends of the OB Library, the OB Historical Society, the OB Mainstreet Association, the OB CDC, the OB Community Foundation, the OB Rag, the OB Town Council, and finally just about everyone in the room was standing. “We’re not a special interest group,” Newsom said with a quiver in her voice, “We are Ocean Beach.” Thunderous applause ripped through the Chambers. This writer got tears. Councilman Ed Harris mingles with OB crowd after historic vote. From L to R: Jason Kocivar in back, John Ambert with face hidden, Stephen Grosch, Julie and Megan in back, Harris, 2 unknowns, and Pete Ruscitti. Once the Council had made their unanimous vote and once the applause had died down, Ed Harris – now beloved by OB planners, came down and mingled with the crowd, as it filtered out to the streets below. Celebratory party at The Local: Gretchen Newsom, Gio and Mindy. A large group of blue-shirted people were last seen heading to a local watering hole, The Local – which is not coincidentally owned by the owner of an OB bar-restaurant, Wonderland. And indeed, OBceans felt this day that they were in their wonderland. What a great afternoon it was for Ocean Beach in the City Council Chambers. Thank you for the very well organized presentations by Frank Gormlie, John Ambert, Jane Gawronki, Mindy Pellessier, Gretchen Newsom, and others. It was a very powerful moment when Gretchen Newsom talked about all the Ocean Beach groups that supported the Community Plan and asked representatives from each group to stand until there were over a hundred people standing. It made me proud to be a part of the Ocean Beach community. Sitting there through the public testimony reinforced what we already knew – we have a very special, unique community. As past chair of the Ocean Beach Planning Board, Ocean Beach Merchants Association and Ocean Beach Community Development Corporation, it was comforting to see the next generation of community leaders rise to the occasion and stand up to those who want Ocean Beach to change. As Ed Harris said – let OB be OB! Steve, seeing you in the audience is good for me heart, as it reinforces the feeling that every generation of the OB planners is with us. Steve I saw you in the crowd but didn’t get a chance to say hi. I too was ecstatic to see a new generation of Obecians take the torch and continue the legacy of us old timers. Note to the editor: Steve served as my vice-president when I was the president of the Ocean Beach Merchants Assoc. in 1983. Another note to editor: I had a great work0ut pushing your car around downtown after the celebratory libations. How is your car? Note to Mike James: the tow back home only cost me $24 and a new battery only cost $55 (because the one that died was supposed to be for 60 months, but only made it half the way) for a total of $79. Thanks for the push, dude, you did pretty good for an old guy. How much was your cab? Or did you take the trolley. #2 note: I thought Steve was a chair at one point of the OB Planning Board. #3: Most are spelling it “OBcean” – look in mirror while wearing the blue t-shirt you just got. #1 Took the Trolley home and downed three Ibuprofens and another beer. #2 Steve like myself wore many O.B. hats over the years. #3 I come from the Obecian camp, but I’ll honor the T-shirt. #4 There is a new pub around the corner from me with some tasty craft beers. Stephen Grosch just moved into my neighborhood. Let’s have an East O.B. meeting soon. Awesome work by those who want to keep OB the last of the Laid Back Beach Towns. January 2015 will be the 99th Anniversary of the FLOOD that helped wipe out any chance OB would become San Diego’s Anaheim. Lets go for a big Thank the Rain Makers Day. As a property owner in OB for the last 30 years, all I can say is Hooray, Hooray, Hooray! Props to the Rag for all the great work they have done to keep OB OB! I wasn’t there, so it wasn’t me booing. I could not be more pleased. Good work. Congrats to all. Congrats to OB. In Frank’s honor let us start a petition to have the Pete Wilson statue moved from Horton Plaza to OB. We can set it up near the SDPD trailer so the pigeons can relieve themselves properly. Congratulations! You all did a great job yesterday! So many people came up to me form the Council offices and congratulated you on your organized testimony. And – the PFFP was unanimously approved right after the plan was! On to Coastal Commission – the attached email includes the CCC procedures. I am emailing staff now so we can meet and discuss outstanding issues and move on to the CCC Hearing. Thanks again – I have enjoyed working with you all through this process! Go OB, our heroes… If you aren’t too tired, would you please join your sister beach communities , Pacific Beach, Morena and Clairemont, in staving off the eager beaver developers new generation seeking to high rise Mission Bay’s circumferences which are composed of: landfill, liquefaction, seismic and flood zones…? The San Diego Planning board has definitely got it wrong… And lawsuits in the future because the developments will sink hole… Gosh, every night on the news we get: ” ! rising ocean levels…” My kids are scared! Micaela, as always, thanks for you kind words. BeautifulPB does NOT advocate “an increase in density in Pacific Beach which eliminates ALL single family zones and doubles the density in the existing multi-family zones”. The Report by the Sustainable Design Assessment Team, who came to San Diego last December, had a long list of recommendations. Some of them we believe are worth exploring with our community. One recommendation involved improving transportation options and connections within PB and to other areas in the region. We are holding a community workshop this Saturday 8:30am at MB High School to do just that! We won’t be talking about density but we will be listening to what people think about Safe Routes to Schools, bike paths, neighborhood greenways and how we will connect to the future mid-coast trolley. Everyone is welcome to participate. After the event you can add you kind comments at our interactive website ConnectPB.com. So glad the best little town in the world will have a fighting chance against big money. I couldn’t be happier that OB will stay OB, and not become PB#2! My HEARTFELT THANKS to the OB RAG for keeping those with our hearts in OB (near and far) informed & involved! I notice a lot of the people against the plan were crying foul on the Rag’s coverage of the story – can’t ask for better praise than that. Check’s in the mail! Long Live OB! “Reasonable use” needs to be really a big deal, not just about more square footage. Every property owner in OB could have a multitude of personal views of “reasonable uses,” none of which would necessarily be unique or exceptional and all of which are not to code; granting variances on such a basis renders ordinances basically meaningless. The word “reasonable” is entirely ambiguous. In construction law, if something in a specification is ambiguous, that is, it can have two reasonable interpretations, the contractor’s interpretation will prevail because the ambiguity is the fault of the owner who provided the specifications. Seems to me this should also apply to ambiguous municipal code language. Thank you all…in this day and age the power of the people is a rare thing to see. What a great example for all who are struggling against greed and corruption. Thank you to everyone! This is meaningful example of community and I REALLY appreciate your efforts! Wow. Thank you. I wish I had been there today. What is almost as amazing as this win for OB is that Frank was able to pound out such a lengthy piece so soon after it all happened. Having written a word or two myself, I know what it takes to do that much good writing and my hat is off to Mr. Editor, for that and for all his effort in helping make this happen. Maybe it’s time to take a long look at the make up of the Planning Commission; this is the second of their ridiculous decisions that has been completely overturned in less than a month. There is a serious disconnection between the commission and the rest of the world. As the phrase goes, “Follow the money”. Tim Golba and Stephen Haase are as corrupt as they come. I just wanted to send out a thank you and congratulations to all involved for the hard work and valuable time invested that culminated in yesterday’s victory. After thirty years in OB, I’ve never felt prouder to be an OBcean than I did when standing in those council chambers. Let the city be on notice: WE ARE OB! well done to all who put themselves out there congratulations and thank you thank you thank you. OB wins Yeah ! Sozar, as we say on my planet! Wish I could have been there. . .Thank you for this article. Thank you to all OBceans who were there in body and spirit. Special thanks to Frank and the Rag for being an important vehicle to bring folks along, get the petition signed by such an impressive number, provide the historical accuracy and context and help keep OB our OB! Glad to see OB people win. It makes me feel good about those original articles in the OB Rag back in 1971-72 about the Precise Plan written by Rodney, myself and others. Different day, same old s**t hole that O.B. is. The limitation on floor area, combined with the small lot size, means that in general if a building is entirely replaced (and kept within the limits of all plans and codes), the cost will be much greater than the value of the property with the new building on it. For this reason, owners will choose not to rebuild, instead doing minimal repairs and renting out the units into which their single family homes were illegally subdivided without permits, or at best doing a “paint and flip” to make a quick buck. The result is that much of OB has a dilapidated appearance and offers potential tenants substandard housing. This is the downside of maintaining the “seaside village” flavor, and it seems inevitable. As for the 3 properties that currently violate this flavor, and the one under construction that threatens to violate it, rising sea levels will solve those problems in a few years. I’m gonna have to disagree with that one, Aging Hippie. The property under existing homes in OB is far more valuable than the buildings on the property. The cost to put a new building would not come close to the cost of the building and the land. If you look at the prices of the new units on the corner of Ebers and Santa Monica, around $800,000 I believe, and use a square foot cost of $250 x 2200/SF, it equals $550,000, which is conservative. And those are small lots 25 feet wide. A smaller 1500/SF home on the same lot would cost about $375k new but would be worth about $600k to $700k. The only way to raise the value of your home, other than seeing land values increase, would be to replace or improve the existing home. Thanks for helping to demonstrate why I am so strongly motivated to move out of OB. Where will you go? There are good and bad things about every place, I know because I grew up a Navy kid and I’ve lived all over the country. OB is a great little community, I can’t imagine how you could improve on living here. Good luck man, wherever you land. But, I have a feeling your dissatisfaction will probably follow you there. You know, Mike, I would have agreed with you at one time but the last time Aging Hippie and I had a back and forth, we actually reached some common ground. I wasn’t trying to give him a hard time with my comment, just offering some facts that tended to be counter to what he said. Hopefully, he will take it in the spirit in which it was intended. Geoff you are a greater man than I.
I am happily surprised to hear that you reached some common ground and had a civil debate with Aging Hippie. Hmmm, I think you meant that compliment for Gunga Din, but thank you for the comment, Mike. FYI – they are pre-selling the 2 unfinished lots at SM and Ebers. You can see them on Zillow. Both are going for $949k. That lot on SM has been for sale at that outrageous price for years. Talk about what it’s worth after it sells, not what the owner is fantasizing it’s worth. Anyone who is taking the risk of developing a property runs a financial risk, and there are certainly issues involved with financing that incentivize highest and best use. At the same time, that is no different with any other type of investment. I respect property rights well enough, but there is nothing written anywhere that says that variances need to be granted just so investors can have a sizable guaranteed profit on Day 1, and especially not at the expense of a community’s character, and even more especially not in the face of the existing codes that are in place. I’m thinking that – even in the face of climate change – developing a nice 1,350 square foot property on a tiny lot near the beach in Socal is still a pretty solid medium-term investment, even if the ROI is not immediate. If you would rather sacrifice community character and the integrity of existing codes to ensure profit for people who often bought into OB knowing what their development opportunities and limitations were, then perhaps OB is not for you and never was. I nevertheless wish you joy on your journey and hope that you find a place who shares your outlook on life. A shout-out of appreciation to “Meredith Lane” for being our on-the-spot photographer. The OB Rag camera broke over the weekend at my daughter’s wedding in Julian. It must have been one of those thunder crashes during the ceremony. Congrats on your daughter’s wedding, Frank, and thanks for helping to lead the charge on getting the community plan approved. I believe Mr. Stebbins was confused when he stated that he wanted the same rights to develop his property as the rest of the 5100 block of West Pt. Loma Blvd. His block, to the south of Voltaire St. on West Pt. Loma, is in the RM 2-4 zone, and subject to the .7 FAR restriction. The block north, between the Ocean Villa Inn and the Ebb Tide Motel, is in a special vacation/tourist zone RM 5-12, with a FAR of 1.8 (as is the Inn at Sunset Cliffs). Long live small scale residences.